John Maclure (34). Killed in Action. 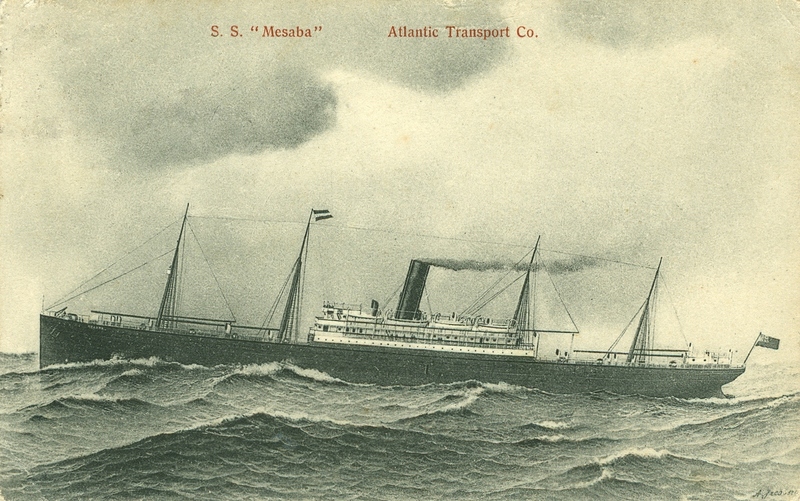 On 1 September 1918 the S. S. Mesaba left Liverpool bound for Philadelphia, USA. At twenty-one miles from Tuskar Rock, off the south east coast of Co. Wexford, Ireland, laying in wait was Kapitänleutnant Hermann Arthur Krauß,. in command of the German submarine UB118. Once in range and without hesitation he gave the order to attack. One torpedo was fired and struck the S. S. Mesaba. Immediately she began to sink, taking with her twenty of the crew, including Chief Steward John Maclure (34) and a second Essex man, the ship’s Master. Husband of. Annie Josephine Clarke, of Wellesley Road. Ilford. Essex. Stanley Adams, the Radioman on the S. S. Mesaba, contacted ‘Jack’ Phillips, the Telegraphist on R.M.S. Titanic. S. S. Mesaba to R.M.S. Titanic. R.M.S. Titanic to S. S. Mesaba. Stanley Adams waited for ‘Jack’ Phillips to indicate that the message had been given to the Captain but he did not respond. U118 is a different submarine to UB118. It is shown to give an indication of size. Length 81.5m. (267 ft approx). 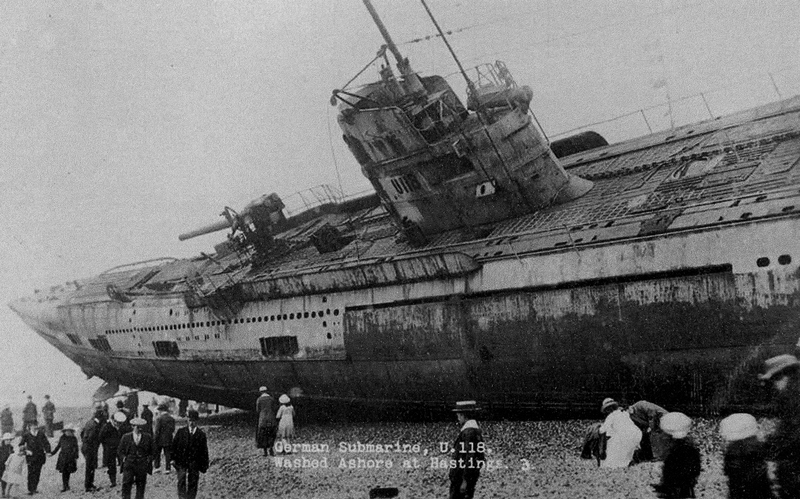 U118 was washed ashore on Hastings Beach. East Sussex. German Submarine U118. Washed up on Hastings Beach. I have recently been given my granddads Continuous Certificate of Discharge book and his first ship was the Mesaba. He signed on as a cook’s boy aged 17 on 09/08/1918 and was on-board when she was torpedoed on 01/09/1918. He survived, fortunately for me, my siblings and cousin. His name was Alfred Louis Kirby Baker. Unfortunately he was killed in 1940 in Liverpool where he was a Leading Fireman in the AFS. Add his name into the Passenger Search facility and this provides the following information. He arrived in 1922 at the age of 47. His residence is given as Boston. Further information is available and to access this you will need to register. Hope this is helpful and provides the answers required. Currently, I have the names of only five crew members. James Francis. Age 29. Royal Navy Reserve. John MacLure. Age 48. Chief Steward. Owen Percy Clarke. Age 52. Master. William Stanmore Glover. Age 39. Chief Officer. William Kildea. Age 31. Royal Navy Reserve. The research for the crew list is ongoing and as other names are discovered I will forward the information. Is there a list of crew? My Uncle Arthur Charles Brady possibly worked as a trimmer on Boston USA run July 26th 1919? ( 2a) Kapitänleutnant Otto Weddigen. 1882-1915. ( 9) James Anthony Gullett. Signal Boy. Killed in Action. (15) Sub-Lieutenant R. C. Whiteside is Missing.